URBAN CHICKENS; THE NEW GARDEN GNOMES? Chickens are 'in' in urban Atlanta. In fact, right across the U.S. sales of chickens to urban residents are up by 25%. Is this some new form of self-reliance? City people taking their eggs into their own hands so to speak? Not exactly. "City folk are turning to chickens ", writes reporter Danny Flanders in the Atlanta Journal-Constitution, "not just as child-friendly pets, but as garden accessories, call them live yard-art, at a time when the mere glimpse of a few fat birds puttering around in the petunias lays a big smile on their faces. Call it the simple life. Credit the fresh eggs. Regardless, chickens are flying high, not just in Atlanta, but right across the country." This schmaltzy urban take on chickens just shows what good P.R. can do for a species. Now, I respect chickens. There's no better method of turning grasshoppers, grubs and seeds into eggs. 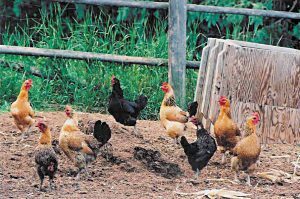 Over decades hens have provided sustenance to the farm family and been a source of income for the farm wife. These day, however, few people know chickens personally. But, they've heard the stories: the Little Red Hen , that thrifty provider, diligently working away in spite of other animals scoffing at her; Chicken Little, the world's first non-human weather predictor, warning that the sky was falling. Wise, dedicated, caring birds. Just the sort of thing for the back yard. Someone should warn those city folk that, unless they change their assumptions about chickens, they are in for some nasty surprises. First, they can kiss those petunias goodbye, along with most other yard plants. Those sweet chickens busily pecking around the property also bite and scratch and will uproot any plant they can get at. There's a reason for constructing chicken runs. City gardeners will have to choose: chickens or petunias. It's not likely they'll get to keep both. 'Child-friendly chickens' eh? Now, there's an urban myth in the making, unless chickens have changed considerably since I used to pass the hen-house at a full gallop hoping to out-distance the rooster. Somewhere, in some breed, there may be roosters which have taken a pledge of non-violence. I never met one. Leghorns, Barred Rocks, Rhode Island Reds, one and all had roosters renowned for their ferocity. Size is no guarantee of gentleness; the bantam roosters were the toughest of all. As for being child-friendly, we children were the ones they picked on because we were smaller and more vulnerable. I have the scar, faded now, from the time I ran headlong into a barbed wire fence trying to get away from the resident rooster. I looked back to see if he was gaining and, when I turned forward again, ran full tilt into the fence. So, a few weeks later when I noticed that rooster sneaking up on me as I was hanging out laundry, I had no compunction at all in smacking him with the clothes-line pole, He gave a muffled squawk and settled into a heap of feathers on the ground. But, not for long. Even my brother, a small pacifist at the age of six, was driven to defend himself. He succeeded, somehow, in trapping the rooster between his legs and pummelling him unmercifully when the rooster attacked him. Nothing made an impression on that rooster until the Sunday afternoon when, drunk with confidence,he over-extended himself, and attacked our father. Father was just coming out of the outhouse, doing up his braces and thinking solemn thoughts when the rooster launched himself from four feet away. He landed, talons out, right in the middle of Father's back. The rooster soon realized his mistake. Dislodged from his perch, he ran faster and faster around the yard pursued by Father who was kicking at him while holding up his pants and uttering strong words. 'Child-friendly"? I don't think so. You may protest that this sort of behaviour is to be expected from roosters, but that hens are kindly, quiet, clucking creatures. Symbols of domestic coziness Hah! Those city chicken-lovers are about to discover the origin of the term 'pecking order'. Far from all getting along in feathered sisterhood, chickens will drive the weakest away from food and shelter if they can. A fine example for the children of America. It's ironic that city dwellers are acquiring chickens just as they are being phased out in rural areas now becoming urbanized. Novice city chicken-owners might well wonder if there are reasons their feathered friends aren't welcome at close quarters. The truth is chickens have several annoying habits not shared by such common forms of yard art as cement rabbits or statues of little boys with wheelbarrows. No matter how good-natured and supportive the neighbours, they won't respond well to the clarion call of Randolph the Rooster every morning at dawn. Chickens may not crow, but they cluck incessantly. Aspiring chickens owners should first peruse their city's noise by-laws. And, all nature is a circle. What goes into a chicken, whether it's worms or chicken feed, must inevitably come out. Unless the chickens are penned- and there goes the value of interactive yard art - the resulting manure will be all over the yard. Explaining to a chagrined canvasser for the Heart and Stroke fund that she's just slipped on a pile of yard-art droppings on the walk may mollify her. Then, again, maybe not. Will chickens be permitted in high rises? Chickens on a 9th floor balcony could have serious consequences for residents below. Maybe city dwellers should closely examine a chicken roost before deciding against hamsters as preferred pets. Chickens can be a serious nuisance at home. But, will they stay home? Unlike ceramic frogs or statues of deer, chickens can fly. The U.S. is a litigious society. The first time a phone rings in Atlanta and a neighbour accuses the next-door chickens of having attacked her cat, eaten her specially purchased garden lady-bugs, wrenched out her pansies, and left droppings all over the pool deck, the chicken owner better hope that his insurance policy covers the depredations of domestic fowl. If not, it's time to start thumbing through the yellow pages for a clever lawyer with a sense of humour. Even in the inter-active society, chickens as yard art seems to be pushing the envelope. If city folk want yard art that cheers but doesn't bite, they should stick with gnomes. 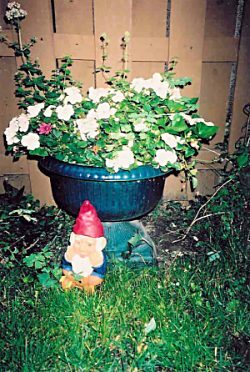 Consider the good qualities of the under-appreciated gnomes. They present an image of industrious self-reliance without destroying the lily beds. No gnome has ever pecked a newspaper carrier. Not one stands accused of leaving a mess on the doorstep for the boss to step in on his way in to dinner. Gnomes, if their switches are turned off, never, ever, awaken the neighbourhood with hideous screeching at 3:30 a.m. Gnomes don't need to be fed, they forage for themselves. Gnomes aren't a temptation to such predators as weasles, coyotes and skunks. Gnomes never lay eggs in some remote part of their own or someone else's yard. Quiet, pleasant, colourful, requiring nothing more than to be moved before mowing, gnomes are definitely yard art for the discerning urban North American.